6:45 PM Health, Home Remedies, How to, Stretch Marks, to, Treatments. Medically known as striae, stretch marks are a form of scarring that can occur on surface Stretch Marks Removal can be achieved using Stretch Marks Home Remediesof the skin. These marks can appear as red, purple or off colored lines on the skin surface. 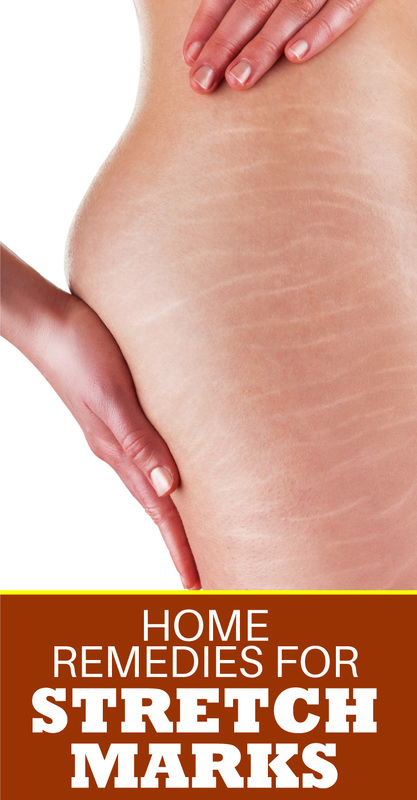 One can commonly find stretch marks on thighs, breasts, buttocks, back, stomach, legs & arms of an affected person. Among the most common causes of stretch marks are obesity & pregnancy. Weight lifting and growth spurt are the other causes. Stretch marks on the skin are often considered ugly and looked upon as a grave problem by many. Stretch marks remedies can help in minimizing discolored streaks occurring in this condition and also improve the skin texture. Most of these stretch marks remedies can be prepared with common ingredients found in your home. These remedies are easy to follow, safe and economical too. Using almond or olive oil for massaging your skin is a good step for stretch marks removal and prevention. These oils contain vitamin E which helps build elastin and collagen fibers that work together to make your skin look healthier and younger. To an ounce of carrier oil, mix five drops of chamomile oil & seven drops of lavender oil. Apply this home remedy for stretch marks on the affected skin once daily. Continue until the stretch marks improve and become lighter. This remedy is also useful in removing stretch marks during pregnancy. Keep yourself fit and in shape. This keeps your muscles toned, makes your skin firm and prevents stretch marks from occurring. Preparing your own remedy for stretch marks removal is easy. Add cocoa butter (half cup) to one part vitamin E oil and mix thoroughly. Applying this preparation acts an excellent moisturizer. It keeps your skin hydrated and helps retain skin elasticity too. You can use topical elastin creams as home remedy for stretch marks. These creams are easily available at medical stores. Applying these on the stretch marks brings about improvement in skin texture. As has been seen, there are various causes of stretch marks and so is the number of remedies. Using these remedies for achieving improvement in stretch marks symptoms requires patience and persistence. It brightens your chances for positive results.